In the thirty years since China initiated economic reforms and its open-door policy, China has been transformed from a poor nation almost completely isolated from the global economy to an engine of growth of the world economy. China’s dynamic transition has been among the most dramatic developments of recent history; and its economy continues to grow rapidly, with important consequences for China’s own society and environment, as well as for the wider world. This book provides a fascinating insight into a wide range of issues on Chinese economy and its three decades of economic reforms. 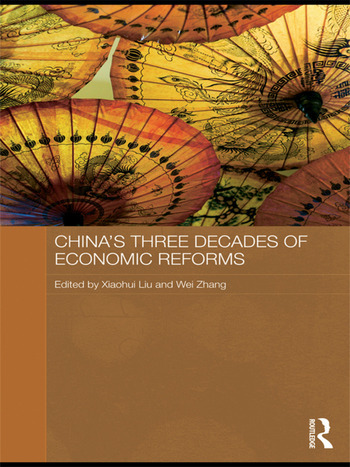 With well-researched, in-depth and comprehensive coverage of key topics, using the latest research findings, this book covers Chinese monetary policy and financial sector reforms; China’s income disparities; the emergence of China’s business groups; the implications of foreign direct investment and innovation and technological developments. The book will be an indispensable guide to scholars, entrepreneurs, policy-makers and all who are interested in China’s economic affairs. 2007 "Stepping Stones to National Market Integration: the Role of Special Economic Zones," in China: Linking Marchits for Grwoth edited by Ross Garnaut and Ligang Song, pp. 394-414, Asia Pacific Press the Australian National University. 2007 "Further Reform of Pension System in China; an Alternative Option to Fully Funded Individual Accounts," Asian Economic Papers, Volume 6 Number 2, pp.112-135, Spring 2007, MIT Press, MA. 2005 "Competitiveness of China’s manufacturing industry and its impacts on the neighbouring countries," Journal of Chinese Economic and Business Studies, Volume 3 Number. 3 (2005), pp. 205–29, Taylor & Francis, London. 2004 "Can the Strategy of West Development Narrow down China’s Regional Disparity?" Asian Economic Papers, Volume 3 Number 3, MIT Press, MA. 2001 "Economic Integration and its Impacts on Cross-Strait Relations," Cambridge Review of International Affairs, vol. 14, no. 2, pp. 201-211, Cambridge. 2000 "Why Is Foreign Investment Concentrated in the Coastal Areas?" Harvard Asia Quarterly, Summer 2000, pp.62-69, MA. 2003 "Assessment of Strategy of Developing West in China" China Economic Analysis Working Papers, Taipei, No. 7. 2003, pp 1-15 (in Chinese).